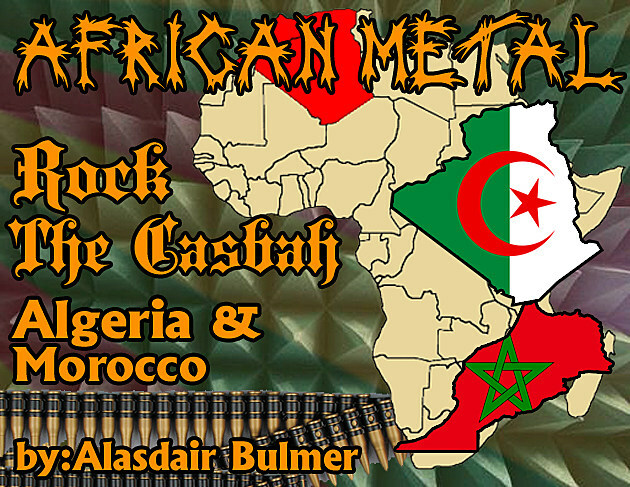 Al Bulmer’s African Metal series delves into the largely uncharted world of heavy metal from Cairo to Capetown, uncovering the varying styles, struggles and successes of metal’s final frontier. In part 3 of this recurring series Al rounds up the North African scenes, taking a look at Algeria’s Berber metal and Morocco’s dark obsessions. Algeria’s contributions to alternative culture extend far beyond The Clash’s reference to The Casbah, the old town district of Algiers that bore witness to some of the bloodiest independence fighting against colonial France. By the same token—albeit a clandestine blaze, if you will—Algeria’s post-colonial struggle is by no means limited to Frantz Fanon and the expulsion of European powers. Lelahell are one of Algiers’ newer extreme metal acts, their concrete-crushing death metal bludgeoning skulls since 2010 with a panzer-like drive and causing much deserved attention in the underground press. Following the completion of 2011’s ‘Al Intihar’ EP, fellow Algerian metallers Slave Blaster and Nihil (who also form the rhythm section of Berber black metal outfit Barbaros), completed the ranks. In 2012 Goressimo Records officially released the band’s debut EP. There is one struggle in Algeria, however, that looks almost inevitable in hindsight: the marriage of Berber (or, Amazigh) cultural movements and black (and folk) metal that gave birth to Berber metal. Although not restricted to Algeria (as per demonstration of Tunisia’s Ayyur) the Kabyle people of the Kabylia region between Annaba and Algiers have thus far been among the most populous and organised advocates and activists of Berber culture, history, and language. Let’s rewind a thousand years or so. The Berbers were the indigenous inhabitants of the Sahara and North African littoral. A heterogeneous and largely nomadic people connected by common language groups, the Greeks and Arabs referred to them as ‘Barbaroi’ (‘Barbarians) and ‘barbar’ (‘noisily’ or ‘jabber’) on account of their perceived other-ness. Not to suggest they didn’t command respect, though; Ibn Khaldin, the great Arab scholar and historian writing in the thirteenth century, considered the Berbers an holistic race and nation enjoying equal status with other great nations of the world. Now, at risk of squeezing centuries of history into a bite size chunk…the Berbers were chilling in North Africa until Arabs moved in, beginning an onset of imperialism not too dissimilar from the Anglo-Saxons pushing the Celts to Britain’s western peripheries or the Christianisation of Scandinavia. History is written by the victors, and by that token, regional conquerors rendered the Berbers ahistorical, losing the privilege as protagonists to their own history. Berber identity movements however began to bubble and boil throughout the 20th century, not least related to colonial divide and rule policies, and as a reaction against modern Arab nationalist and identity policies. Despite a Berber undercurrent in Algeria’s war of independence, a continued and concentrated marginalisation of minority groups caused by the ruling majority’s promotion of Arabic unity culminated post-independence with the upstart of Berber Cultural Movements both domestic and expatriate. By his testimony, the revelation of a hidden, ignored, even repressed heritage inspired a certain degree of propagation and a restored sense of worldly belonging. It is a trajectory familiar to metal musicians worldwide, and all the more vital for the indigenous group Barbaros represents. In his promotion of Berber culture, the raw savagery and ancient growls of Barbaros hasn’t been his sole vessel. As many North African metal bands grow tired with the stale thematics of Satan and death, delving into one’s national antiquities offers an entire new realm of metallic cultural expression. For Azar, Ayrod’s more concentrated Berber folk metal project, there’s barely a distorted fifth to be heard. Check out an Azar audio stream HERE. Likewise, Andaz Uzzal, a Folk Metal Berbere project masterminded by Ryad Chehrit, represents the Berber community’s expatriate contingent in France and offers a more celestial and dreamlike reminiscence of Berber culture. Temporarily sticking with the Berber theme out on the Maghreb’s western edge, Morocco’s Berbers equate some forty per cent of the population; it’s not too surprising, then, to discover Berber metal here as well. Marrakech black metallers, Ahaky N’ Bror, mysterious and obscure, recorded a hasty, washed-out, and all-around unpalatable call-to-arms in 2007 entitled ‘Berbers Kriegers’. Moroccan metal has otherwise suffered similar persecution to what we’ve recently seen in Egypt. Religious conservatism in the media and in legal and power structures frowned upon the ‘dangerous’ activities of heavy metal. In 2003 a Moroccan judge incarcerated fourteen metal fans for heinous crimes like possessing ‘diabolical CDs’ and wearing ‘Satanic’ t-shirts. Ten years down the line, according to the LA Times in 2010, Moroccan metal (and the wider alternative scene) flourishes, even receiving the blessing of King Mohammed VI. Sounds positive, right? Or so one might think were it not for the Moroccan extreme metal community possessing a morbid penchant for musical melancholia. With Lifesenseless’ grief-ridden funeral doom and the ambient depressions of A Cold Demise, there’s at least a gloomy few hell-bent on decimating all reserves of vitamin-D, sun-soaked Mediterranean coastline or not. The foul stench of death metal’s varied miasmas have also surfaced, ranging from the symphonic melodies of Nocturnal Kingdom to Ephemeral Promise’s orthodox grunts and grinds–further proof of North Africa’s potential as a simmer cauldron of extreme metal!